Here's a delicious chicken recipe using only five ingredients. 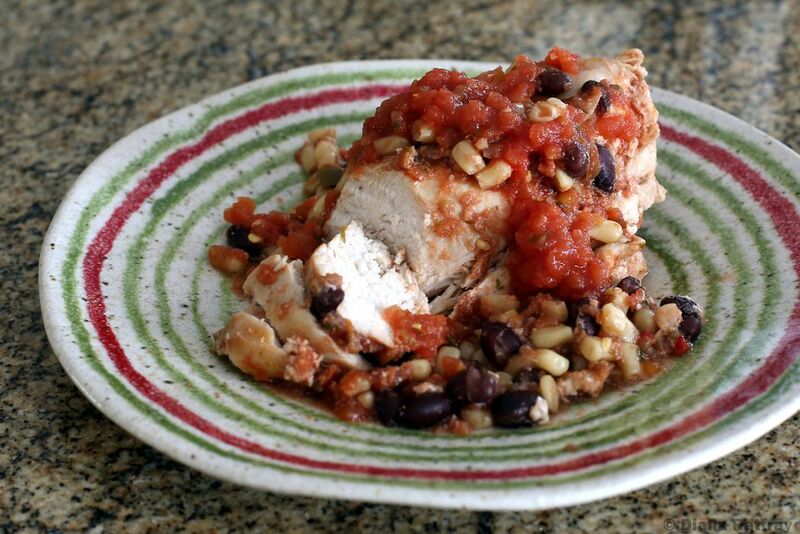 The Tex-Mex flavors stand out in this tasty dish, and the crock pot makes it super easy. Make easy Mexican-style rice to go with the chicken and serve it with warm tortillas or cornbread. This recipe can be easily scaled up or down. In a 3 1/2- to a 5-quart slow cooker, combine the black beans, corn, and 1/2 cup of the salsa. Top with the chicken breasts and then pour the remaining 1/2 cup salsa over the chicken. Cover and cook on high for 2 1/2 to 3 hours, or until the chicken is tender and white throughout. Do not overcook or the chicken will be dry. Sprinkle cheese over the chicken; cover and cook until the cheese melts, about 5 to 15 minutes longer. Another way to serve this dish is to chop or shred the chicken after it is cooked and place it on soft tortillas with the salsa mixture. Top with shredded cheese and a dollop of sour cream, if desired. Avoid cooking the chicken breasts for much longer than the recommended time. Chicken breasts are very lean, so they tend to dry out when overcooked. If you must cook it longer, try the recipe with boneless chicken thighs. Replace the chicken breasts with boneless chicken thighs. Slice an onion and add it to the slow cooker with the beans and corn. Omit the cheese or use a Cheddar Jack or Mexican blend of cheeses, or use pepper Jack or taco-seasoned cheese.